Ok … there has been a staring match going on, yours truly, the Zoo studio blog slave and the cold white panel of the empty edit-box of the blog on the screen. Gotta be honest – the white panel was easily winning right through January, its blank expanse mocking any weak attempt by cold and uncomfortable fingers to fill it with words… its rare that the carriage return would even strike off a paragraph before “the draft” was abandoned and the computer shut down. So here it is – it had to come – it might be not be witty, it might be brief, but it’s here… the thaw, the crack in the icy silence. The first entry of 2013. Phew! Lets hope it will get easier to get the huge backlog of updates posted… we have got lots to tell. 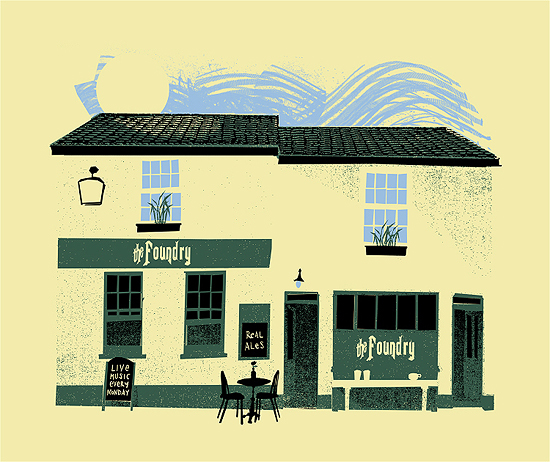 Down to business then, here’s a print commission we produced at the close of last year for the lovely people at The Foundry pub here in Brighton… It was to commemorate the boozer’s 5th anniversary and was distributed to the staff and regulars by landlord Ian – what a nice chap. This entry was posted in Art Print, Friends, Screenprints and tagged affordable art, art, arts and crafts, boozer, Brighton, collectables, foundry street, illustration, limited edition, petting zoo, print, pub print, public house, screenprint, serigraphy, The Foundry Pub. Bookmark the permalink.